Please note that our next Car Boot Sale will be held on Sunday, June 25th 2017. As usual this boot sale will take place in the Circus Field, Carrigaline (beside Lidl). 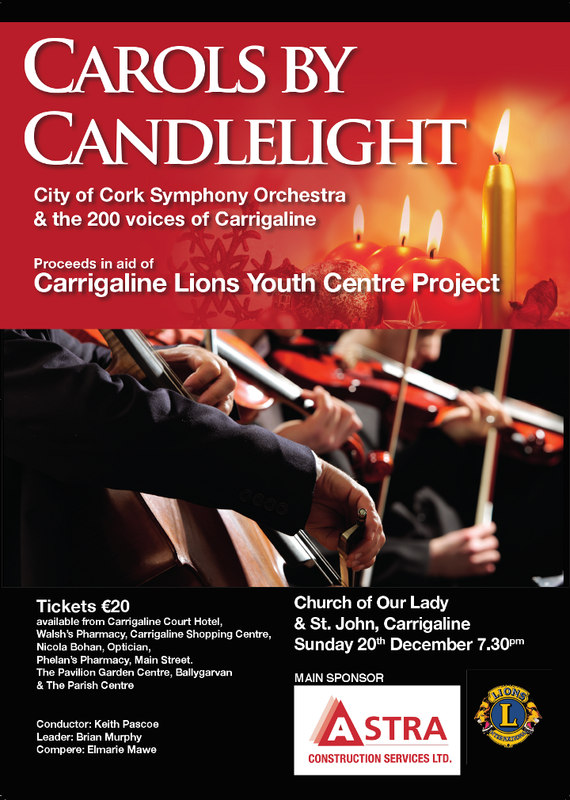 All proceeds will go towards the new Carrigaline Youth Centre. Registration for the 2017 Great Railway Run is now available here. See thegreatrailwayrun.com for full details. The Carrigaline & District Lions Club Annual Cycle Classic takes place on Saturday, October 8th, starting in Carrigaline, heading along the Wild Atlantic Way to Timoleague, looping back to The Old Head Of Kinsale and returning to Carrigaline. The 2016 event is again sponsored by Mr John O’Connor of Victoria Cross Cycles. 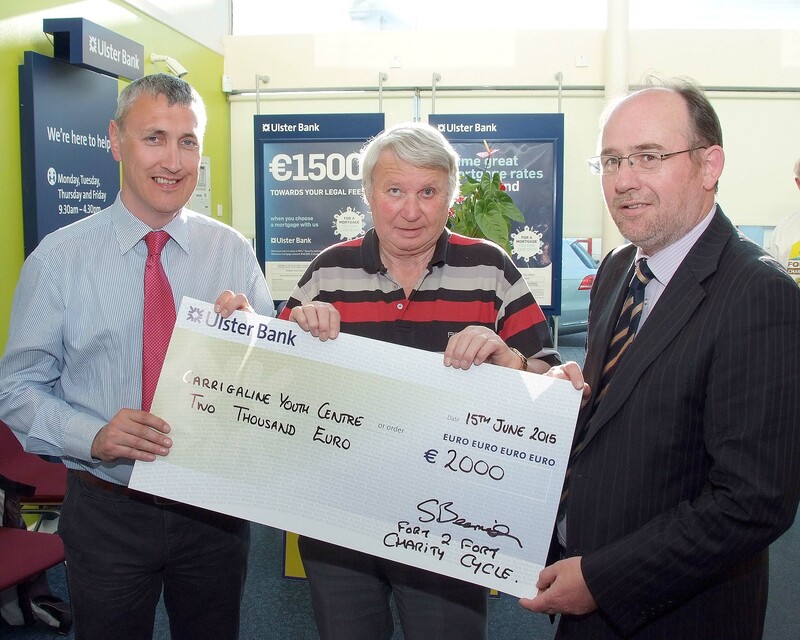 The cycle classic is the club’s major fundraiser and is now celebrating its 25th year, coming from humble beginnings in 1991 when just 18 cyclists raised €2,500. 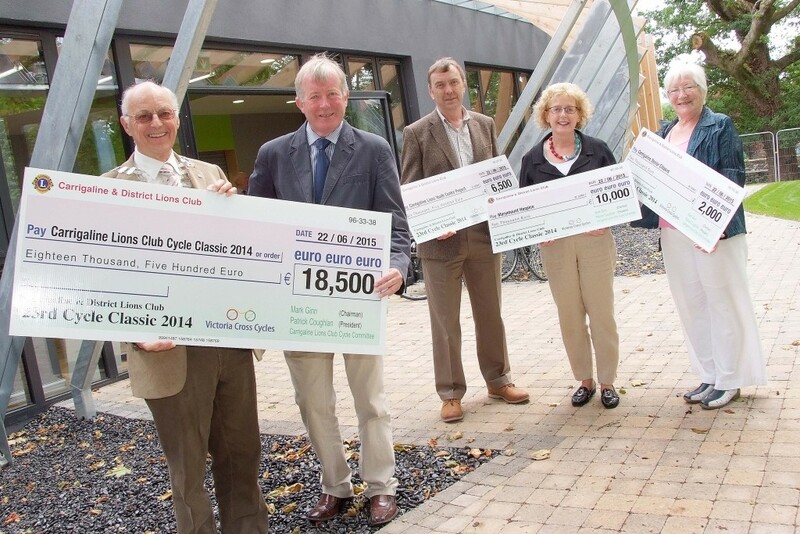 Suppport for the cycle has grown steadily over the years and last year, approximately 150 cyclists took part. 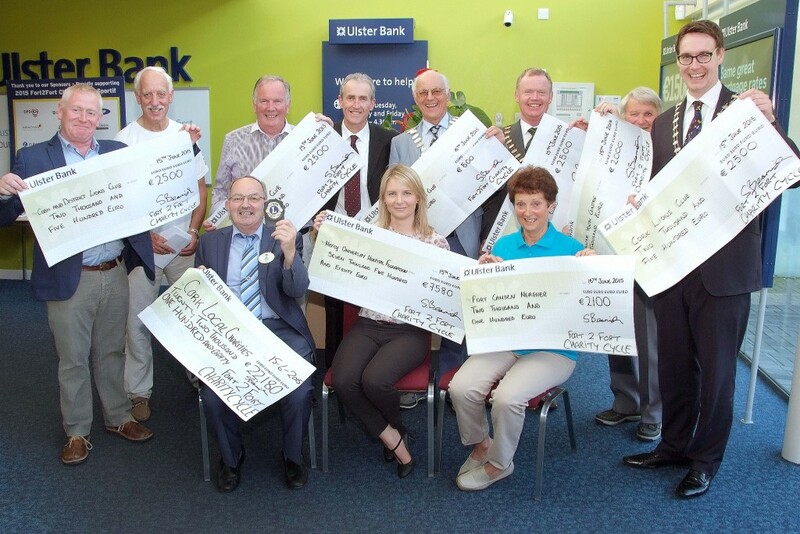 Over the 25 years, over €675,000 has been raised for local charities with the majority of the money raised being donated to cancer related charities. 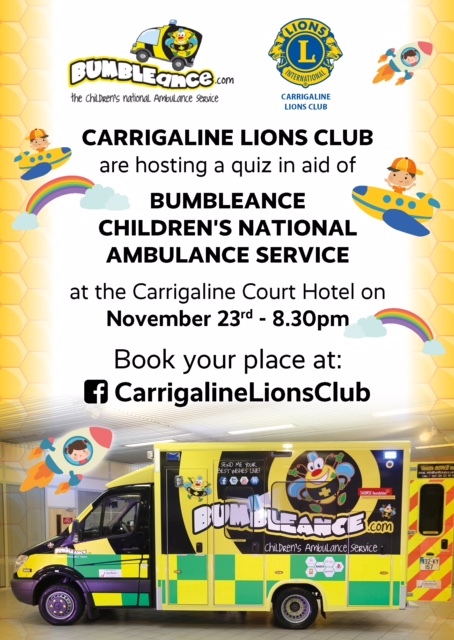 The proceeds of this year’s event will go towards a number of local charities including Marymount Hospice and the Carrigaline Lions Youth Centre. For further details on the cycle classic contact Mark Ginn on 021-4373088. Our Car Boot Sale is back!! The first sale of 2016 will take place on Sunday, 24th April in the Circus Field, Carrigaline (beside Lidl). This is our 24th Annual cycle, which takes place on Saturday 10th October 2015. 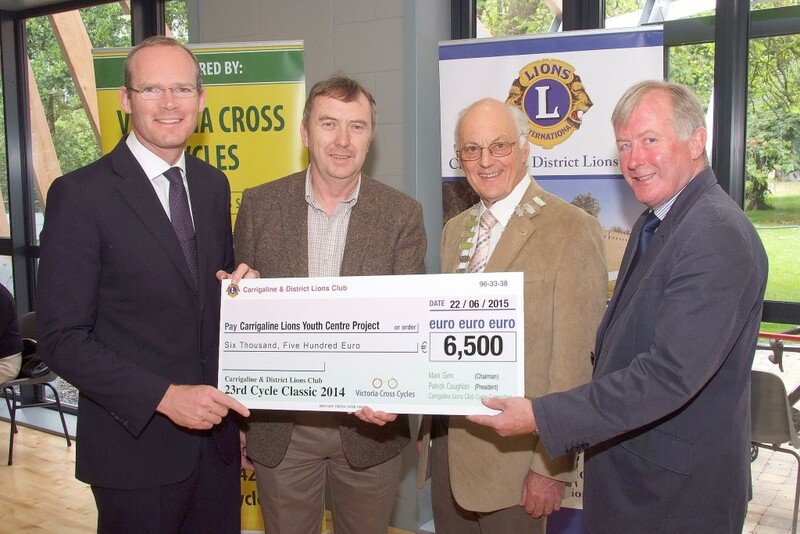 The launch of the 2015 Carrigaline Lions Cycle Classic took place in the new Carigaline Youth Centre on 22nd June. The 2015 event takes place on Saturday 10th October and will run from Carrigaline to Kenmare. Over €18,000 was raised from the 2014 event. 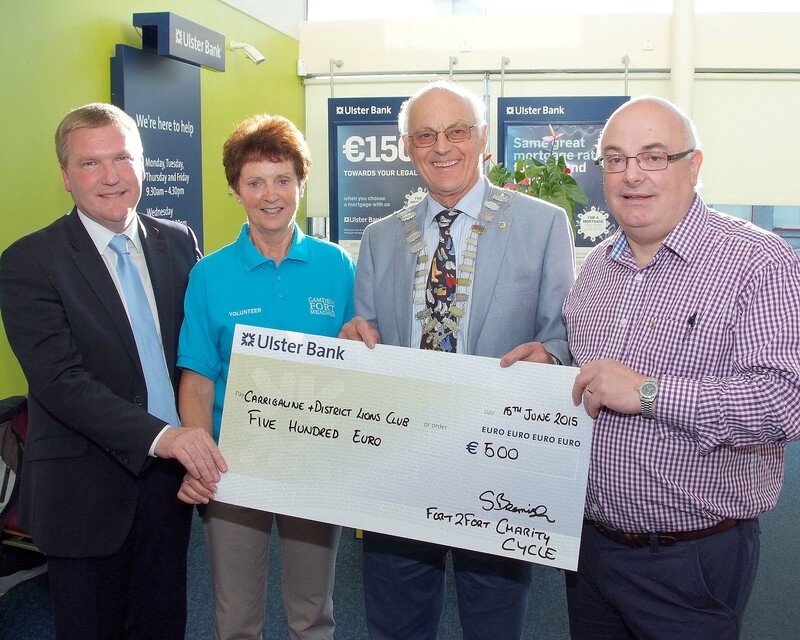 Pictured at the Presentation of Cheques from the €18,500 proceeds of the Carrigaline & Districts Lions Club Annual Charity Cycle, were from left, Patrick Coughlan, Club President ; Mark Ginn, Cycle Classic Co-Ordinator ; Sean Duggan, Carrigaline Youth Centre Project ; Dr. Marie Murphy, Marymount Hospice and Agnes O’Reilly, Carrigaline Senior Citizens Day Care Centre. 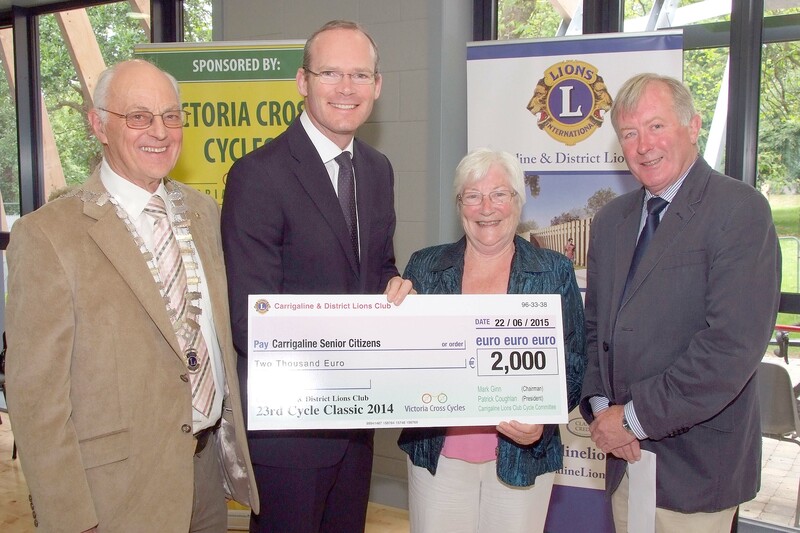 Pictured at the Presentation of Cheques from the Proceeds of the Carrigaline & Districts Lions Club Annual Charity Cycle, were from left, The Minister for Agriculture ; Food ; Defence & The Marine, Simon Coveney, TD ; Sean Duggan, Chairman, Carrigaline Youth Centre Project ; Patrick Coughlan, Club President and Mark Ginn, Cycle Classic Co-Ordinator. 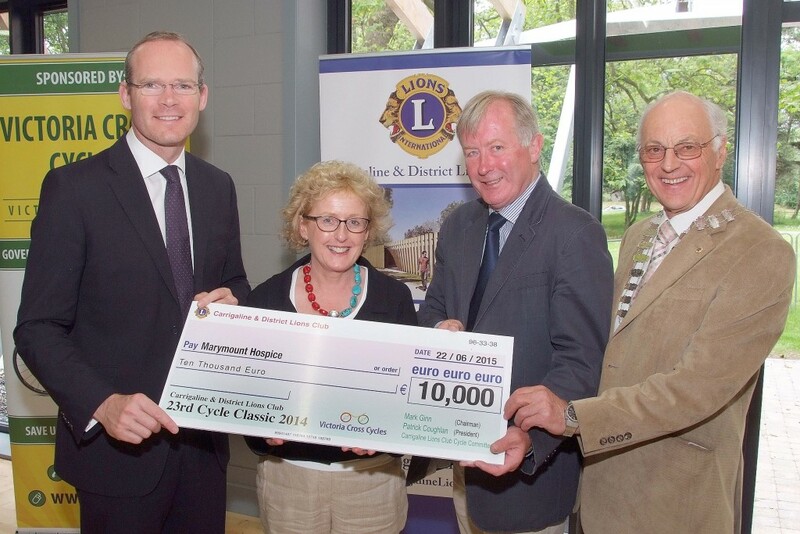 Pictured at the Presentation of Cheques from the Proceeds of the Carrigaline & Districts Lions Club Annual Charity Cycle, were from left, The Minister for Agriculture ; Food ; Defence and the Marine, Simon Coveney, TD ; Dr. Marie Murphy, Marymount Hospice ; Mark Ginn, Cycle Classic Co-Ordinator and Patrick Coughlan, Club President. Pictured at the Presentation of Cheques from the Proceeds of the Carrigaline & Districts Lions Club Annual Charity Cycle, were from left, Patrick Coughlan, Club President ; The Minister for Agriculture ; Food ; Defence & The Marine, Simon Coveney, TD ; Agnes O’Reilly, Carrigaline Senior Citizens Day Care Centre and Mark Ginn, Cycle Classic Co-Ordinator.